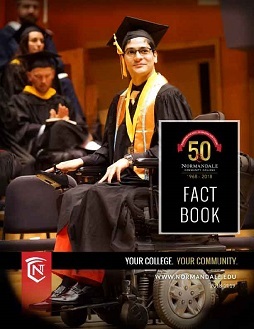 The annual Normandale Facts At a Glance Brochure provides summary information about Normandale Community College. Official printed copies of the Facts at a Glance can be requested from the Office of Research and Planning. The annual Fact Book provides detailed information about Normandale Community College and its operations. Official printed copies of the Normandale Fact Book can be requested from the Office of Research and Planning. A member of the Minnesota State Colleges and Universities system, and an equal opportunity employer and educator. The information in this document is available in alternative formats to individuals with disabilities, and/or those who accordingly need a reasonable accommodation; please contact Debbie Tillman at (952) 358-8625, toll free at 1 (866) 880-8740 or email osd@normandale.edu.